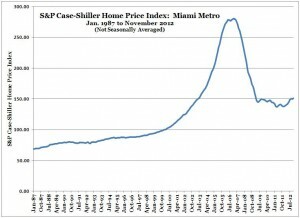 The S&P Case-Shiller Home Price Index for Miami posted a modest gain for the three-month period ending November 2012. 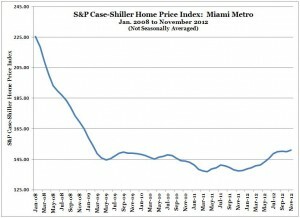 Prices gained 9.9% year-over-year (Nov. 2011 to Nov. 2012). That’s a fast pace for real estate, and certainly far quicker than incomes have risen. No doubt the Fed-sponsored drop in mortgage rates helped. And there could be a bit of an echo bubble in psychology, as media reports have served up a steady drumbeat of housing-recovery stories. This much is certain: Even if prices continued to rise 9.9% annually, it would take over 6 years for prices to get back to their bubble high. The fact that it would still take so long at such an unrealistic pace for prices to regain their high is a testament to the mendacity of the bankers, brokers and buyers who inflated the bubble. 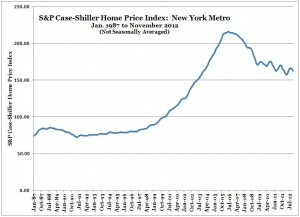 Meanwhile, in New York, the real estate market remains moribund. Not quite back at its low, and maybe there’s a broad, bowl-shaped bottom taking form, but that’s about the best you can say for it. Nonetheless, the crash already happened, and prices have reverted close enough to the long-term trend that the risk of loss has diminished. If you find a good deal, and plan on holding a property for a long time, buying may make sense, particularly if you plan on financing at currently low rates. posted by // This entry was posted on Tuesday, January 29th, 2013 at 11:50 pm and is filed under Real Estate Market Data. You can follow any responses to this entry through the RSS 2.0 feed.